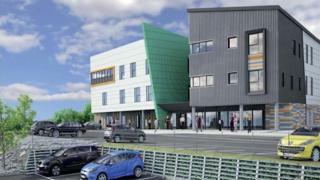 A new integrated care centre is to be built on Cardigan's former Bath House site with £23.8m in funding. Work will begin on the centre in spring 2018 and it is expected to open in late 2019. The centre will offer a GP practice, dental service, pharmacy, mental health and disability services and a minor injuries service. Health Secretary Vaughan Gething said it would bring care closer to people's homes. Announcing the Welsh government funding, he said: "It's imperative that people are treated in modern centres and this project will facilitate an improved, integrated approach to healthcare in the community, all under one roof." Another part of the Bath House site had previously been earmarked for a supermarket, but since that fell through in 2014 it has remained undeveloped.